I have this stove from camp chef and love it. I have only used the oven once and it is a little finicky but I am impressed so far. The two burners on top are very convenient and perform very well. I added a simple hanger so I can hook it to my ladder. Perfect height and a very conventient position. 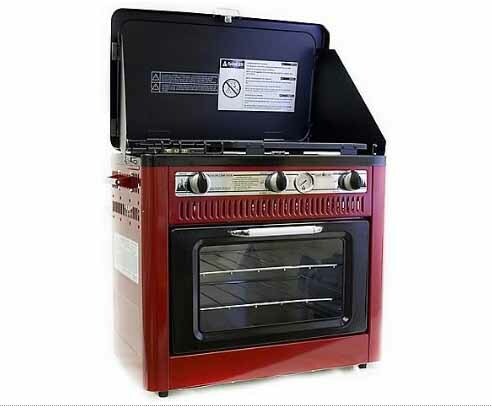 Any of you ever tried a propane oven like the one below? We've got the propane stove top in our teardrop, but I'm thinking of additional teardrop options primarily to accommodate my home chef wife (BTW, she gets to compete again in this year's Gilroy Garlic Festival). I watched a friend of mine bake brownies in one just like that at our annual Mt. Shasta Snow Trip last February. It worked great for a camp oven, cooked reasonably even. What happens if the road is narrow Ron? No problem, I got lockers. i had a setup like that but whenever I stopped at a light the homeless would steal my pizza.